When you have to take cover from an EF5 Tornado your garage storm shelter is a good place to take cover. The Garage Storm Shelter can be underground or above ground. Both types of our Garage Storm Shelter are rated for an EF5 Tornado and have passed the Texas Tech Impact Test for an EF5 Tornado. At Oklahoma Shelters our employee’s build all of our Storm Shelters and our employee do all the installs, we do not use sub contractors. If you would like a Free Tornado Shelter Quote you can call us at 405-300-0950 or you can email us at sales@oklahomashelters.net and we will be able to give you a Free Shelter Quote today. You can call us at the phone number above. A storm shelter or safe room specialist will be able to help you with your Free Tornado Shelter Quote. One of our representatives will answer any questions you have. We have Underground Cement Shelters. Underground Garage Shelters. Steel Safe Rooms. All of our products meet and exceed FEMA guidelines. Each product is rated to withstand the force of an F5 tornado. We offer a Free Tornado Shelter Quote and Free onsite Consultations to help you with your pick which shelter is the best for you. We offer Free Storm Shelter consultations for your home or business. One of our storm shelter agents can help you with your decision on what shelter is best for you. We have underground shelters. That you can put in your backyard. We have storm shelters that you can put in your garage that are underground in your garage. We custom build safe rooms that can be installed at your home or business. If a tornado happens you need to have a plan that will help protect you and your family and we can provide you with a Free Tornado Shelter Quote. All of our shelters and safe rooms meet and exceed FEMA guidelines. All of our products have a 10 year warranty against leaks or corrosion. The garage shelters is sprayed with a liner. The liner is leak proof. The underground cement shelter are sealed to help prevent leaks. Our steel safe rooms are completed encased in steel. They have a steel floor. We anchor the bolts every 12 inches. Each bolt has 10,000 pounds of sheer strength. We can make cutouts for electrical cords and if the safe room is going against a plug. We can make a cutout for an electrical plug for the safe room. Call us today for you Free Tornado Shelter Quote. Storm Season is here again in Oklahoma and here is some information if you want an OKC Storm Shelter from Oklahoma Shelters. All of our OKC Storm Shelter are rated for an EF5 Tornado. Our employee’s do all of our installs, we do not use sub contractors. We have great reviews from our OKC Storm Shelter customers. We know how the install comes out every time because we build and install all of our Storm Shelters. Oklahoma Shelters has several different styles for an OKC Storm Shelter. Oklahoma Shelters installs several types of Storm Shelter. In Miami Oklahoma the Peoria Tribe Housing Authority broke ground for the installation of 120 new tornado and storm shelter units on Wednesday that will be installed by Oklahoma Shelters. Oklahoma Shelters, Tribal officials, Peoria Housing Authority staff, residents, tenants, tribal members and others came to the ceremonial ground breaking to kick off and commemorate the important event. This project for our communities in Miami, Fairland, Wyandotte and Quapaw. They have different sizes, depending on the size of the residence. The project is funded through part of a $1 million HUD Grant. It provides a storm shelter for each of the total 400 housing units. Peoria Tribe Chief John Froman said the shelters will be placed at all four sites. The project is funded by the ICBG tribal grant funds to increase the safety of tenants. “It’s going to be convenient and very accessible for our tenants,” Chief Froman said. “This project is long overdue. It is for our tenant’s safety and our elderly, and the small families here. This project is something that the board and the tribe felt really strong about. The project will be between $500,000 to $600,000. The grant is set up for several different things. We earmarked it for rehabilitation. The PHA is the first Indian housing authority to do stand alone individual storm shelters. For a project like this. They will construct one large storm shelter where everybody can meet. We decided to make it convenient to our residences and put the Storm Shelter in their back yard. Below are over 140+ Storm Shelter Reviews from some of our customers. At Oklahoma Shelters we use Our Employee’s to install our products. That way each Shelter is installed the same way and always look good after the install. Each of the Storm Shelter Reviews below are exactly what they posted on Google about Oklahoma Shelters. If you click on any name. The link will take you directly to what they posted on Google for their Storm Shelter Reviews about Oklahoma Shelters. Great job, thank you Oklahoma Shelters. We are very happy with our Storm Shelter !!! They did a great job. Len came out and looks thing over. On the install day the crew was here on time and did a great job. I would definitely recommend them. The best company I’ve ever dealt with, they were organized and the workers are perfectionist. For my Storm Shelter Reviews I’m very satisfied with my shelter. They cleaned up the mess immediately. Great company and i highly recommend them to install your shelter. You will not regret it. A truly fantastic company! They did everything they could to make sure my shelter was installed as quickly and conveniently as possible. The instillation crew was friendly and left no sign any serious work done aside from the cleanly placed storm shelter. As for the shelter itself, it is pretty nice. Seems sturdy and safe. We called and talked with them. They went over all our options. We decided to go with them. One of our friends went to the fair. They ordered a Garage Shelter from another company. It was $100 cheaper, but they had wooden stairs and steps. Our Garage Shelter has steel steps and benches. My install looks great and theirs doesn’t. We are so glad we went with Oklahoma Shelters. They are great to work with. Our shelter looks much better then our friends does. We would recommend them to anyone looking for a Storm Shelter. It is rare to find a business as professional, service oriented, and motivated to do quality work as Oklahoma Shelters! When I finally made my decision to move forward with getting my shelter the installation was done in less than a week and the installers did an outstanding job. I could not be more pleased and gladly posted my Storm Shelter Reviews! They were great! I called to get a quote and Len sent over everything we needed in a timely manner. He got us on the schedule and when a new (earlier) time opened up he was able to move it. The installation team did a great job and was very efficient. I highly recommend. I did my homework and decided that the “above ground” storm shelter was the best option for where I live. After we looked at the Storm Shelter Reviews and found Oklahoma Shelters I Contacted Len Branch on a Sunday and he answered. Then I visited the storm shelter show room Monday. Later that same week, they installed the safe room. It was a straight forward process and I am very pleased. I would recommend Storm shelter to anybody. We were very pleased with our new storm shelter. They came on time and did a great job. Len was even nice enough to stop by before hand and make sure we had a good spot and enough room for the truck to get into the back yard. Their guy that ran the bobcat ( Mike I think) even spread some of the leftover dirt around the yard for me. He did an awesome job packing it around the shelter. We would recommend them to anyone. Great company! Informative, organized and easy to work with. We had a garage install and everything went smoothly and was clean when they left! I’d definitely recommend them. Communication was top notch, the main reason I chose this company over any out of Tulsa. Installers were early, very clean, professional, and answered all of my questions. Look forward to using them when I decide to build my next home. Very easy process. No hassle or pressure to buy. They can custom build to fit your needs. Good price. I read their Storm Shelter Reviews and found out that they are the Best company I’ve ever dealt with. Came on time and very professional in installing the shelter. We are pretty please with the service and result. Len and his team is the best. We’ll surely recommend to friends. Great job guys, we’re pretty safe now. My experience with Oklahoma Shelters was very easy and hassle-free from the beginning to end. And the installers were very professional. I would recommend this company for your shelter needs. Very pleased with our above ground safe room. The turn around time from contacting Len to getting the safe room installed was amazing! Less than 2 weeks altogether! Thanks, again! We were very pleased with the fast, friendly and professional service. They were here on the day expected and the storm shelter was installed in just a few hours. Love it! Everything that was described to me regarding building and installing the above ground shelter was done. Installers were very polite and diligent in getting the installment done. Just hope it never has to be used. Very professional! Showed up on time, did a great job and cleaned up the mess! Highly recommend and gave them a great Storm Shelter Reviews. Good price and good installation. I was extremely happy with my experience dealing with Oklahoma Shelters. I highly recommend them. They were great to work with and installed our quality shelter quickly. We called a few shelter companies and when we talked with Oklahoma Shelters we could tell that they knew the shelter industry, we also read their Storm Shelter Reviews. They were great from start to finish. The installation crew was awesome and they showed us everything about our shelter. Great company to work with. It was great from start to finish, Len answered all our questions and the install crew did a great job. I would recommend them for sure and wanted to post my Storm Shelter Reviews. Oklahoma Shelters did a great job for us, very easy to work with them. I would recommend them, they did a very good job for us. One of our friends had them install a shelter and theirs looked good so we called them to install a shelter for us. They were great and did an awesome job, thanks Oklahoma Shelters !!! They installed over 10 Storm Shelters at our drilling sites, and would definitely recommend them, they do a great job. I contacted Len at Oklahoma Shelters about installing a 5×7 flat top shelter in my backyard, and unlike another local company, Len actually came out to my house and gave us an honest recommendation on the shelter we wanted versus the shelter we needed. We live on a lot in a subdivision and we would have lost a lot of yard space had we chosen the yard shelter, so we went with the garage install and couldn’t be happier. Len at Oklahoma Shelters answered all my questions and concerns. The install crew was professional in every way. The shelter is of high quality and craftsmanship, along with being the best price on the market. I have already recommended them to my neighbors and friends. Just purchased an above ground shelter. It was installed within a week of purchase and we are very happy with the service and install. We recommend them if you are in the market for a storm shelter. Amazing job guys! They were super friendly and got the job done! Thanks to much for everything! Len is great to work with; fast response! Very quick install date after order placed. Installers very professional. Shelter exactly as described..very solid beyond expectations! They did a great job. Very timley and friendly. I would recommend this Company to everyone. Amazing job we love our shelter!!! The shelter is well built and the staff was very friendly. Excellent work, they did a great job!!! After looking around for shelters and pricing a few out, I decided to call Oklahoma Shelters for a consultation. Len was very kind and prompt with the services he provided for our family. He came out that same day on his way to Kingfisher and gave me all the information I needed. I talked to my husband and went ahead with a 10-12 person shelter. Given that it was storm season, there was a two week wait, which we expected. We didn’t mind. Great experience with Oklahoma Shelters. Len was very informative and helped to answer all my questions. Installation went as planned. We have not had to use the shelter yet but feel so much safer knowing it’s there! Thanks Oklahoma Shelters! Oklahoma shelters were great! From initial contact to getting the shelter installed in my garage took only 10 days. Everything went smoothly, good customer service and the installation went well. Very professional throughout, would definitely recommend to others! Great company. They use their Own Employees. They put in 50 Storm Shelters for us and everything went smooth on our project. They put in Concrete Shelters, Underground Garage Shelters, and Safe Rooms on our project. I would definitely recommend them. Len and his team are phenomenal!!! His equipment operator has the skills of a surgeon. I am a Realtor and I will recommend them to every single one of my clients! Clear explanation of all options, quick availability, and professional installation. Installation took about 45 minutes. Really easy to work with and communicated quickly and excellently. I am so-o-o-o-o happy with this company and HIGHLY recommend them! Price was cheaper than all my friends paid for other companies. (And they had complaints about their service with these other companies) Len is a great guy – he was excellent with communication and walked me through the process and gave me all the information I needed very quickly and clearly before installation. Very pleased with our storm shelter and the process. Len was very helpful and we had our storm shelter delivered and installed very quickly. It was great. From start to finish. Very pleased with our above ground safe room. The turn around time from contacting Len to getting the safe room installed was amazing! We had the storm shelter installed in less then 2 weeks. After we called them! Thanks, again! Solid merchant. Professional sales and service. Quality products. I am pleased. Did a great job. Made sure we were happy with the installation. Would definitely recommend. Great job, we are very happy with our Storm Shelter and Oklahoma Shelters. They are putting in one for our daughter next week. Excellent company all around. Thank you to Len and all those who work with him. We are very happy with our new shelter. Great company, very good price and delivery time. Very happy with our shelters. I bought two tornado shelters, one for my shop and one for my house. I definitely recommend Len and his team. Len was very clear about price and the details of the shelter. We had a small issue after installation and Len made sure it was handled immediately. If you are looking for a high quality reliable company for storm shelters, Len and his team should be your choice. They answer your phone calls, they answer your questions, they are professional and fast. I highly recommend Oklahoma Shelters. Excellent customer service. Prices are as amazing as the product. Installation team was outstanding. Would highly recommend them for your storm shelter needs! Len (owner) was professional, courteous and explained all aspects of the sale and the installation. The installation crew was quick and left no mess whatsoever. I highly recommend Oklahoma Shelters. I can’t really say enough about this company. Mike and Billy were awesome installing this shelter. They exceeded my expectations with everything. Len, answered all my questions and made the entire process headache free. They took care of everything I needed. I highly recommend Oklahoma Shelters to anyone in the market to purchase a shelter for their home. We ordered a storm shelter from Len and were super excited to get it installed. This Oklahoma Shelters crew did my garage install near Lake Tbird. Very professional. They gave me an hour’s heads up, which gave me time to get home from work. They were right on time. My driveway is very narrow and they were careful not to mess up too much turf with their truck, trailer and hoe. Very clean job of cutting the concrete floor. Made quick work of the dig and the install. A+. they did a great job. Being new to the area we researched a lot of companies. We decided to use Oklahoma Shelters after reading all the positive storm shelter reviews. The reviews are true! Len and his crew were great to work with, and very professional. After doing some research on the different companies installing storm shelters I decided on Oklahoma Shelters. Very knowledgeable staff and they help me choose the best storm shelter to fit my needs. The install was very professional and they did a great job cleaning up. Had a 5x8x6’ storm shelter installed, one of the biggest I could get locally, in-ground. They did a great job, coordinating the time for install. And they worked all day to get it done, and done right, exactly what and how I wanted it. They took the time to move items out of the way in my garage. Cleaned up after themselves. Thanks! What a Great experience and a great storm shelter. The process was easy. I’m a curious individual and the guys had no problem answering my questions. Very professional and straight to the point. Information is freely given. Had a great experience! Very well priced, waiting time was not long. And very fast communication with the manager. Being a new resident of OKC and unfamiliar with storm shelters, it was a blessing working with Len Branch and company’s installation team (not contractors) at Oklahoma Shelters. Len made the process very east. Very happy with our shelter. The installers were very professional with my family and they did a great job and cleaned up everything as well. Thank you to Len and the Oklahoma Shelters staff on a job well done. Highly recommend Oklahoma Shelters. Storm Shelter Reviews. Easy process, good price, and it was a very clean install, really professional installation. Excellent in all regards. High quality. Excellent coordination on installation. Len and his team have been responsive, respectful and professional in all three of the shelters they have installed for me in the past two years. I can highly recommend them for this work. We purchased a 5′ 5″ wide by 10′ 5″ long unit with 9′ high ceiling. The unit was delivered on schedule and installed without any problems. Great service! They were very very patient with many delays in delivery and installation of the safe room. Taylor – thank for the 5 star review, we really appreciate it. Delivered and installed very fast! Great company, great employees. Very courteous & friendly. Highly recommend Oklahoma Shelters. Len I want to say thank you for everything. I have worked with a lot of people. I appreciate your dedication. Good service. I helped my mother buy her storm shelter thru the FEMA partial reimbursement program, and couldn’t be happier with Oklahoma Shelters. Their shelters were made of thicker steel, had floors of the same thickness (others had NO floor at all), and they did everything they said they would do. Oklahoma Shelters even helped her with documentation to support her reimbursement packet. Great company, I would definitely recommend them. Len was on top of everything and made sure everything went through in a timely and perfect manner! Len prepared all of the paperwork and was quick to respond to questions. The install was professional and super quick. Our garage/driveway was cleaned very well after the install and the quality of the product is top notch. Overall very pleased with our choice for the shelter. Len, It has been great. We are enjoying the above ground shelter. Every time a walk past it I pat it on the door. We have not needed it but it is there for us and the neighbors now have a key. Thanks, you did a great job. Len and his crew made this experience absolutely painless. The appointment was scheduled within a week of the phone call and the crew arrived on time. They left the work area spotless and ahead of schedule.After the transaction was completed, Len went the extra mile by filling out the paperwork for the county rebate that we were eligible for. I wouldn’t hesitate to recommend Len and his crew to anyone interested in a storm shelter. I emailed for a quote over the weekend, had an answer within a couple of hours. Had it installed a few days later. Super fast, super easy! Len and the installers were great. Thank you! I would recommend Oklahoma Shelters anytime. Len came out and gave me his honest opinion and recommendation and worked with my schedule. On the day his guys were to install I had a bit of an accident and had to go to the ER. My wife stayed home to let the guys in and they were totally professional and my wife felt completely comfortable handling it in my absence. It shows the type of company they are when Len called me the next day to check on my well being and ensure I was healing well. All I can say is, is they are a great group of people. Thanks again Oklahoma Shelters. At Oklahoma Shelters we have Underground Garage Storm Shelters. Underground Cement Shelters. Steel Safe Rooms. Our shelters pass the Texas Tech Impact Test. Each shelter is tested to withstand flying debris. That comes from an EF5 tornado. Theymeet and exceed FEMA 320 and ICC-500 Standards. Each shelters has an Engineer Approved Seal. The single most asked question we receive here for our OKC Storm Shelters at Oklahoma Shelters is: What is the cost? 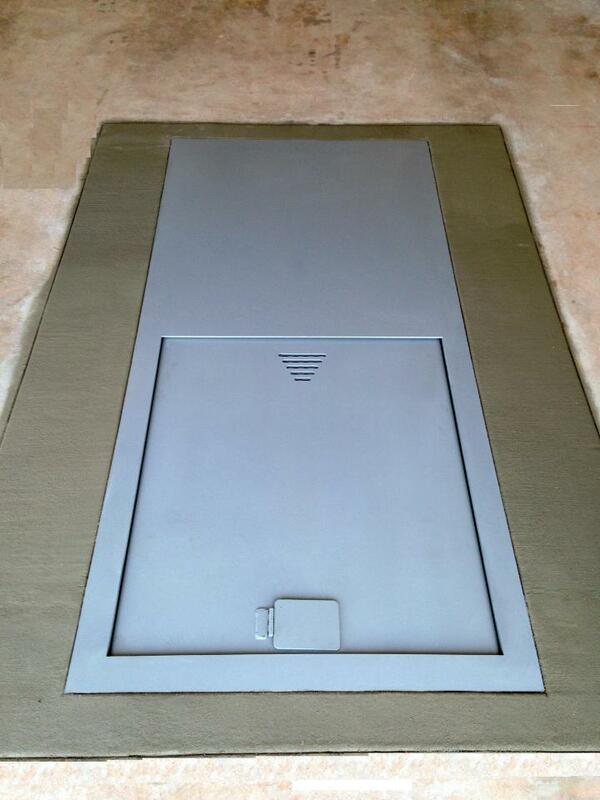 We have OKC Storm Shelters starting at $2400 plus installation and delivery. All of our OKC Storm Shelters meet FEMA requirements. We have install dates within the next 7 to 10 days. They are rated to withstand an F5 Tornado. We have a small, medium, large, and extra large. We custom build all of our shelters and they Meet or Exceed FEMA requirement and they are rated to withstand an F5 Tornado. If you have room in your backyard or front yard. You can also consider a OKC Storm Shelters Slope Top or Flat Top Cement Shelter. These OKC Storm Shelters are underground shelters and are 6’2” high. The problem in some city neighborhoods is there is not enough room to get the shelter truck in the backyard. To install an underground cement shelter we need enough room to get the shelter truck into the yard. The truck will need to backup exactly to where you want the shelter to go. We have 2 sizes for Underground Cement shelters Slope Top 6’x8’x6’2” high, 7’x10’x6’2” high. The Flat Tops are 5’x7’x6’2” high, and 7’x10’x6’2” high. For people who have trouble walking down stairs or need to have something wheelchair accessible we also have Steel Safe Rooms. Our Safe Rooms are custom built and come in several sizes, they have a 3 foot door and are 6’2” high. The OKC Storm Shelters Safe Rooms are also rated to withstand an F-5 Tornado. When we install underground garage OKC Storm Shelters in the garage. We mark the garage floor and cut out the slab. Then we dig out the dirt to the size required for the shelter. After it has been dug out and is level we unload the garage shelter and lower it into the hole and finish installing the shelter. We concrete the bottom and at the top we use rebar at the top when we finish concreting the shelter. 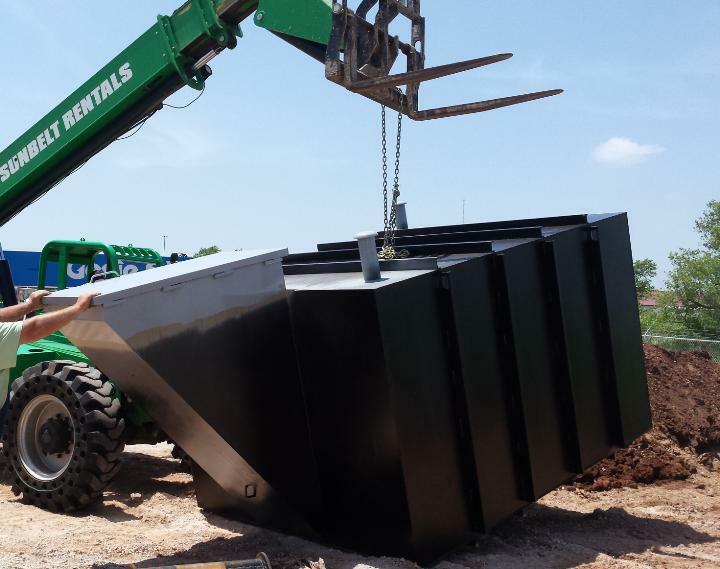 The bigger OKC Storm Shelters cost more due to fact that they have more steel for the shelter, they require more work for the install (digging and dirt removal) and more concrete when completing the installation. To get a quote on a shelter you can call us at 405-367-7901 for a free consultation.